[When I joined the Institute for Advanced Study in Princeton] I did this in the hope that by rubbing elbows with those great atomic physicists and mathematicians I would learn something about living matters. But as soon as I revealed that in any living system there are more than two electrons, the physicists would not speak to me. With all their computers they could not say what the third electron might do. The remarkable thing is that it knows exactly what to do. So that little electron knows something that all the wise men of Princeton don't, and this can only he something very simple. Szent-Györgyi, Albert (1970). The Crazy Ape: Written by a Biologist for the Young. New York: The Universal Library Crosset & Dunlap, A National General Company. pp. 20-21. Retrieved on July 24, 2017. Attributed to Szent-Györgyi by w:Gerald Holton (1978); cited in: Robert Cohen (1985) The Development of spatial cognition. p. 363. "Research is to see what everybody has seen and think what nobody has thought." Gerald Pollack (01/30/2008). Water, Energy, and Life: Fresh Views From the Water's Edge. University of Washington TV. Retrieved on February 5, 2011.. In a television interview, ca. 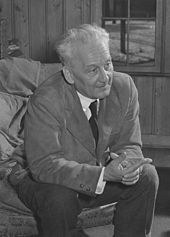 1980.Albert Szent-Gyorgyi discusses religion, National Library of Medicine.